Can you spot the catch? 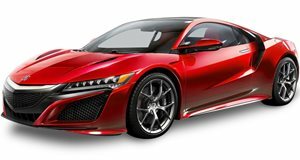 The Acura NSX carries a price tag of $156,000 in the US, around $316,000 in Australia and something close to $415,000 in China. But this particular model that’s up for auction with Copart is currently listed at just $72,500. As you can see, it needs a bit of work, particularly up front where there’s a fair bit of damage. The rear has also been subjected to so-called ‘secondary damage.’ Interested parties should also note they will miss out on the Acura Insider Experience given to new buyers. Under the car’s highlights section, Copart says “that the vehicle started, could be put into gear and was capable of moving forward under its own power.” So that’s a bonus. According to Jalopnik, the NSX was involved in a crash when the driver was undertaking a spot of “spirited driving” in the rain. He has since decided to sell the model and replace it with a brand new one. With some 7,312 miles on the odometer, a tidy interior (save for the deployed airbag), and a powertrain that appears to be in good working order, this bargain-basement NSX represents a superb opportunity for anyone with a body repair shop and time on their hands. So, any takers?